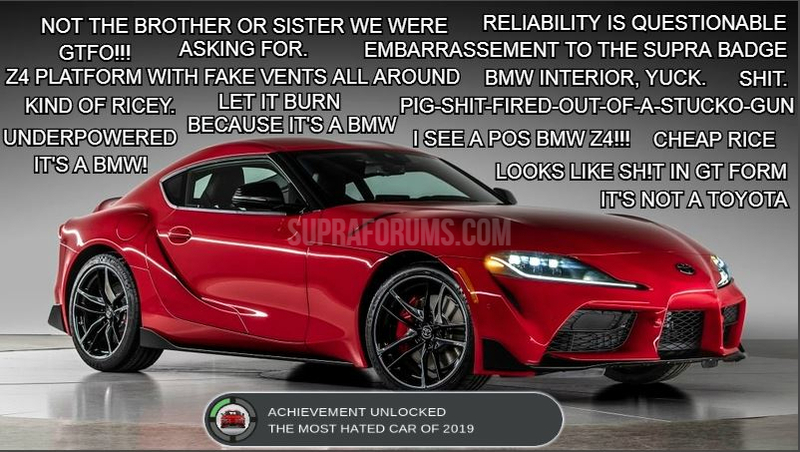 Toyota Nation Forum : Toyota Car and Truck Forums > Toyota Nation Forums > Toyota News & Site News > Why Do People Hate The New A90 So Much? For many, the A90 Supra is not the successor to the A80 that fans have been waiting for. With a platform and motor that’s shared with the new BMW Z4, its difficult not to look at the Supra and see a BMW parts bin car. To Toyota’s credit they have gone on record to say that these two cars have been tuned much differently but is this the kind of treatment that such a legacy product deserves? The response to the A90 would have been much different if Toyota had simply outsourced the powerplant, but the parts sharing does not stop there. The suspension, wheel hub and bearing package, steering column and HVAC system all seem to be pulled directly from BMW. The body may be unique to the Supra, but even the engine mount support brackets that are welded to the frame rails are shared from the X3 and X4. READ MORE ABOUT IT: Why Do People Hate The New A90 So Much? Last edited by AutoGuide.com; 03-29-2019 at 01:14 PM.